Totally dedicated to the design and creation of quality silicone moulds. From research and development, conceptualization. Simplicity & intricacy defined by Crystal Candy. Yet again! Mesh stencils are made of mesh cloth – a food safe, flexible, light weight and durable product that can use over and over again. Mesh Stencils can be used on fondant to create stunning detailed effects. Let me set the scene: you’ve spent hours in the kitchen, baking cakes and assembling your layers. Fatigue sets in, and there’s no way you feel like piping or gearing up for a more intense time in the kitchen. But you don’t want the cake to fall flat when served because the presentation isn’t something you’re proud of. 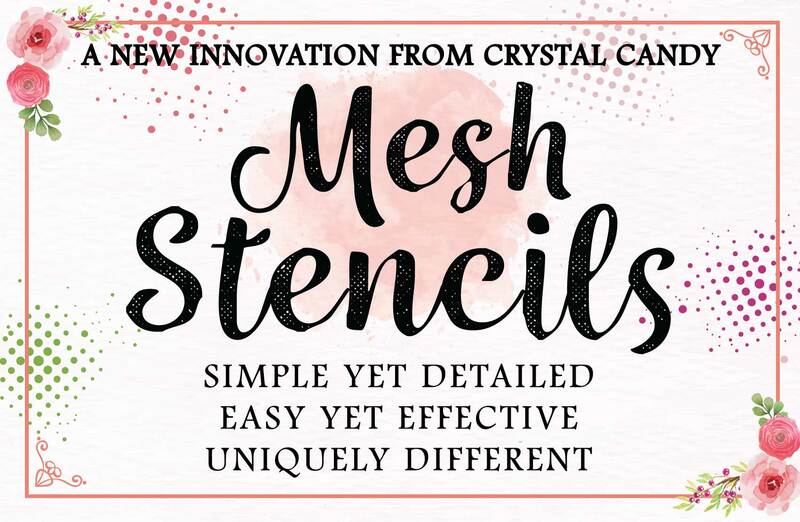 For a display to impress, a new Crystal Candy Mesh Stencil will be exactly what you’re looking for! Our Mesh Stencils exemplify innovation through and through. Extremely fine detail that only Crystal Candy can produce. As always a Proudly South African product. Manufactured, designed and produced by Crystal Candy SA! Due to influx of orders to Crystal Candy, please be advised that orders will be dispatched via courier 5 to 7 working days from receipt of payment.